In The Castle of Eliv Thade, if you type in the word rehaxtint you will get one extra hint. 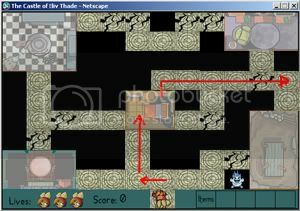 There's a secret path in the Castle of Eliv Thade. To use it, from the starting position, go up 1, left 1, the click either up 1, 2, or 3 and solve the anagram and you will move to that space and a path will appear behind you! Click here to enter a site that will solve the anagrams for you. But some times neopets will ask you to unscramble the neopets words which takes a lot of time.